1. In a large bowl, cream together sugar and butter with mixer. Mix in each egg one at a time and beat until fluffy. Add vanilla and yogurt. 2. In a separate smaller bowl, mix together flour, baking soda, salt, baking powder and caramel bits. Fold this dry-ingredient mixture into the butter mixture just until blended. 3. Using the small bowl, mix together the flour and sugar for the crumb topping. Add softened butter and beat with mixer until crumbs form. 4. Spoon and spread half the dough evenly into the bottom of a greased, deep-dish pie pan or square baking dish. You will need to use your fingers to spread dough. Layer apples over dough. Sprinkle half the caramel bits next. Then half the crumb topping. Repeat layers. 5. Bake at 350˚ for 20 minutes then covering the top with foil and bake for an additional 15-20 minutes or until a fork through the center comes out clean. 6. While cake is baking, prepare icing by beating together powered sugar, cider and milk. Place in a squeezable condiment bottle and use to top the pie when cooled, right before serving. 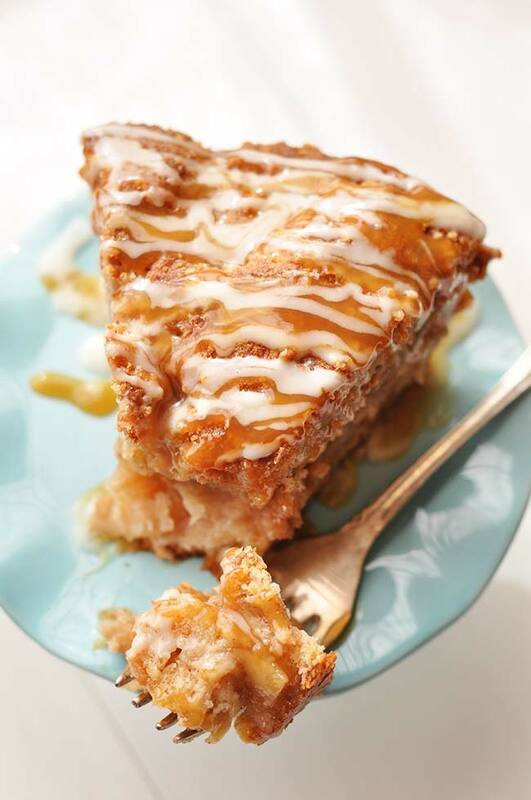 Use homemade or store bought caramel sauce as a topping as well if desired. Sometimes getting some time to yourself to process your thoughts is what you need to navigate through difficult times. Sometimes it’s really hard but I’m learning to embrace all the seasons of life. Even the not-so-fun ones. The trying ones. The humbling ones. The ones that make you want to give up. That ones make you question your identity. The ones that make you question your worth, your value, you ability to contribute something meaningful to this big world. Even those can be beautiful. My grandpa, always freely giving out nuggets of wisdom, used to tell me “Don’t forget to stop and smell the roses.” I don’t think he meant it literally of course but a lot of times you can find some peace in nature. I know I do. Right now appreciating the turning leaves, the fruits that are in season, the harvest moon, the cool evenings, even the spider webs… all the things that make fall, fall. Knowing that it’s not going to last long makes we want to soak in this time of year and make the most of it. For me, taking things that aren’t going to be around forever and making the most of them helps me appreciate the season I’m in. I don’t want to look back and regret not appreciating what was right in front of me. Even something as simple as taking fresh, local apples and turning them into a cake that I can enjoy with my family is enough. Make the most of what’s in front of you. Things don’t have to be complicated but you do need to put in a certain amount of effort to not just let the seasons pass by. Dive in and enjoy them. Eat some cake with your family. 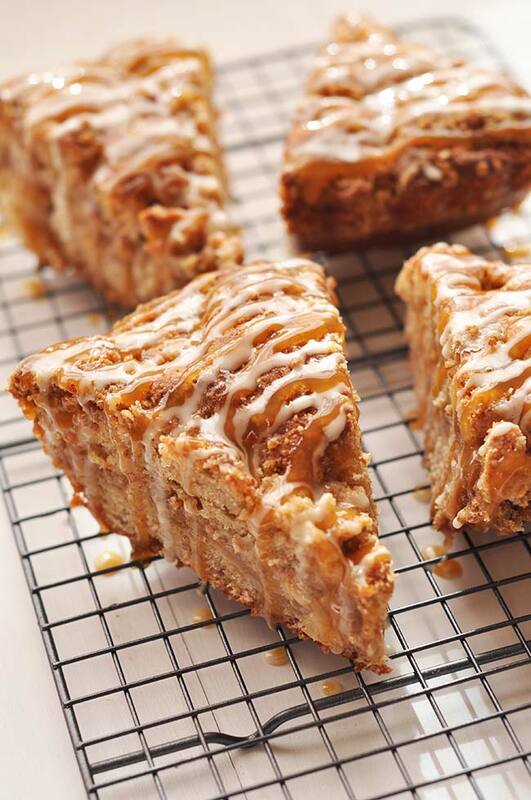 Perhaps this caramel apple crumb cake with apple cider glaze? Sometimes you need a short cut. I get it. Life’s busy. Maybe it’s no longer fall and fresh apples aren’t plentiful or maybe you just don’t feel like peeling a bunch of apples. Go ahead and spare yourself some time. You can buy already peeled apples or you can also just use apple sauce for this recipe. It’ll still taste great! Promise. 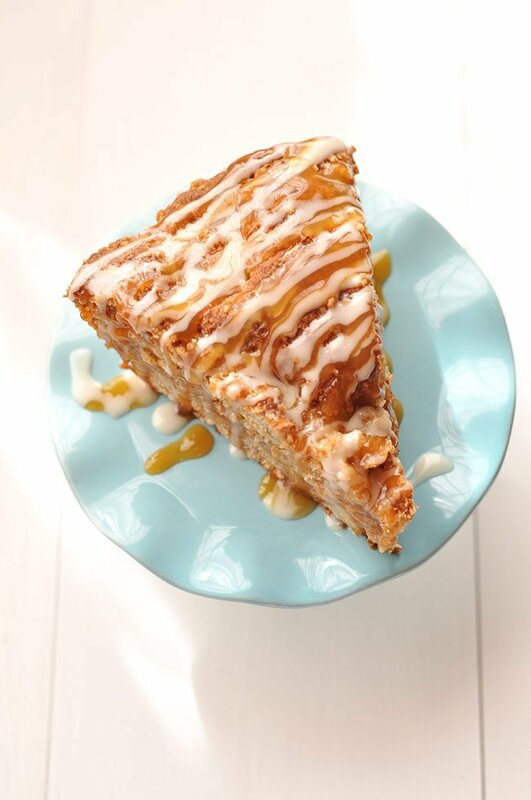 😉 I mean, it’s caramel apple crumb cake…. Sometimes putting something on a pedestal can make things feel more special. My feeling is, if you’re going to go to the trouble of baking a special treat from scratch, then you need to display it proudly! 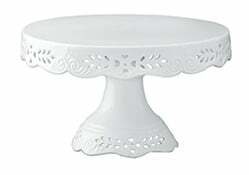 I scored the mini cake stand above at Marshalls and I adore it! It’s perfect for taking photos to show you guys what the inside of the cakes and pies look like. It’s not really practical for every day use though and so that’s why I thought I’d recommend a full size cake stand so you guys can enjoy presenting your cake in a pretty way too. If you love apples, check out my tips for making the perfect yet super easy candy apples using a kit. 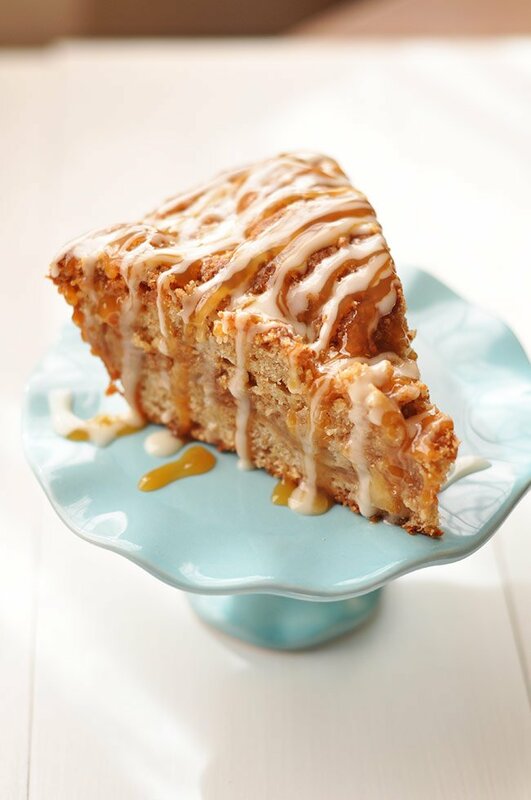 This caramel apple crumb cake was featured on Wow Me Wednesday!